How do you clean your patent leather shoes and handbags? My advice: if you have a well-stocked kitchen cupboard, you don’t need to bother with commercial patent leather cleaners. 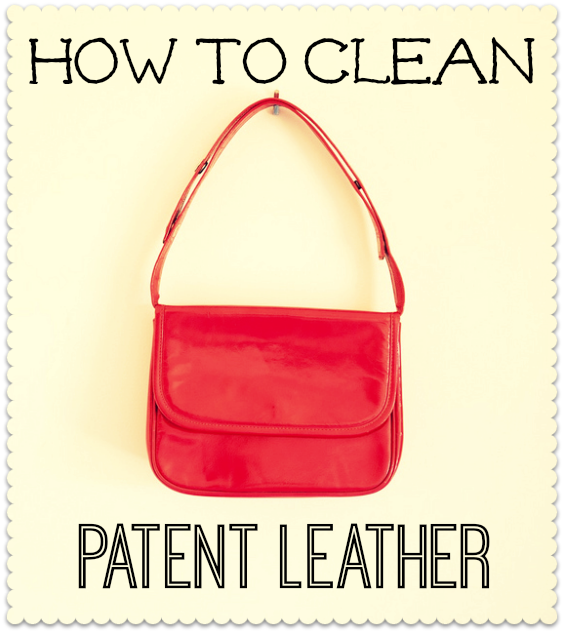 I originally shared this how-to on the blog five years ago, and was recently reminded of it when a Miss Thrifty reader called June emailed asking how to clean a “sticky” patent leather handbag purchased from a charity shop. All you need is a little olive oil and a couple of soft cloths! Dip a cloth in the oil and rub it over the shoes or bag. Leave for 20 – 40 minutes, then wipe off with a clean cloth. This cleans the leather, keeps it from cracking or scuffing – and costs practically nothing. This has always worked a treat for me, for cleaning patent leather shoes, boots and handbags. Here is a turn-up though: when June tried olive oil cleaner, on my advice, it didn’t work! The bag was still sticky. This puzzled me, just because olive oil works so well. Looking around fashion forums, however, I note that “sticky” patent leather is a known issue: apparently the glue can degrade over time, if the item is stored in an extremely humid environment. If you have sticky patent leather on your hands and olive oil does nothing, you may have to write your patent leather off as spoiled, but according to the forums there are a couple of tried-and-tested cleaning solutions you should try first. You can watch and wait: leave the item for a while, to see if it dries out by itself. Or you can try white vinegar. The use of nail polish remover is also recommended, but that stuff is (literally) paint stripper, so I’d only use it as a last resort. UPDATE: Thanks to Miss Thrifty readers Julie (below) and Carol, who got in touch to say that Vaseline is also a good fix. Use it as you would the olive oil. Worth a go! I’ve always struggled to justify busting out the wallet to buy commercial leather cleaner. Typically, I end up just not using my leather items instead of actually finding a good solution. I really like your suggestion here. I am definitely going to try that out! How about cleaning paint off of patent leather. For removing scuffs and paint a “magic eraser” (white sponge made of some sort of material to remove marks from crayons) works very well. But do not rub too hard, it will dull the finish. Thanks Anastasia! I’d definitely recommend trying out the magic eraser on a small, inconspicuous part of the shoe or bag first. Those sponges can BUFF. I’ve been searching for a way to get an adhesive “sticker” off a beautiful Donna Karan large black patent leather bag. My girlfriend thought it would be nice to have an Angel sticker affixed smack dab in the middle of the bag. I didn’t want to hurt her feelings but I was horrified😨!!!! Any suggestions on how to remove the adhesive sticker off one of my all time favourite bags? In “car shops” you can buy a spray to remove sticky labels from the bodywork of cars. Test WD40 on a part that is not seen. I have used it to remove “Flag Day” stickers and Blue Tac. Just spay on and buff off. Some of these stickers if not removed carefully will damage leather, leatherette, sued and is a problem to get off some furry toys etc. Baby Oil is very useful for leather. I have a motorcycle jacket that cost £36 in 1968. I liberally apply the baby oil, leave it for 10-15 minutes to soak in then wipe surplus off with kitchen towel. It keeps the leather waterproof and supple, and helps preserve the stitch work. For odd dirt marks, try using a banana skin(inside) on leather. what about goo gone for the sticker adhesive? it’s sort of an oily substance and i hardly think it will damage the patent leather. Eucalyptus oil might work as well for removing the sticker goo. It’s great for getting sticky goo from price stickers off of hard surfaces. Once again, test in an inconspicuous spot. Oooh – thanks Phillip, great tip! I managed to step in a puddle of lacquer type liquid in a store parking lot. On the way home my Sebago dockside boat shoes (brown leather with white rubber soles) were sticking to the car pedal and floor mat. Dish soap, Goo Gone, alcohol, Kaboom bathroom cleaner and nail polish didn’t make a dent. In desperation, I tried Professional Strength Goof Off. The lacquer came off but it melted part of the rubber sole and took some of the color from the leather. I ended up applying a little bit of WD-40 which helped even out the color of the leather and gave the shoes a nice, new, polished look. $90 shoes were saved! Good luck getting the sticker off your handbag! My wife had problem with her sticky leather purse. I launched a big research project with great florish ending with a whimp. Wife suggested to use talcum. I did that and it worked. It made sense. The stickiness needs something to stick to. Talcum powder provided just that. I sprinkled talcum lightly on the sticky surfaces and spread it evenly. Wiped it off with a soft cloth. Then wiped with a damp cloth to restore the leather to its original color. Finally wiped with a dry cloth. Have tried the olive oil on my 1st pair of patent shoes, works a treat. Thanks for the tip. Olive oil does a good job cleaning and polishing patent.